White Dove Releases and White Dove Displays are what we do. Wedding Dove Releases: April-October Only. 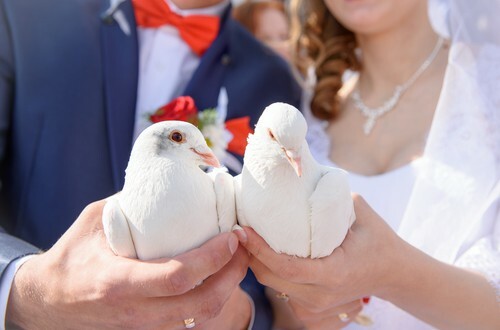 PKG 1 • BRIDE AND GROOM RELEASE : One White Dove Release or Two White Doves released for or by the bride and groom. PKG 2•WEDDING PARTY RELEASE: Two, plus up to six White Doves released. PKG3• RECEPTION DISPLAY: Two White Doves in a lovely cage display, NOT released. 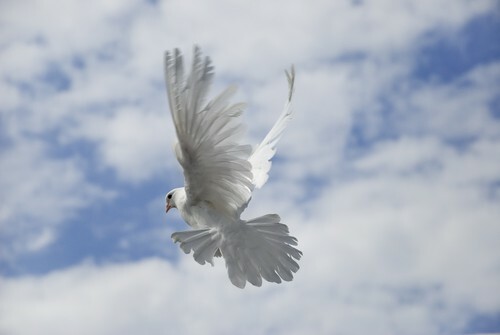 PKG 4 •DOVE RELEASE :Our most breathtaking Ten to fifteen White Doves released. Dove Indoor Displays: Displayed at the Funeral Home. In lieu of flowers, send a Dove Display : 1 or 2 beautiful White Dove display cages ( up to 6 doves in each display cage) can be setup to enhance and leave a lasting memory. All displays are setup prior to and throughout the visitation and services at the funeral home of your choice. This is most popular during the months of November – March when my Doves are not released. Funeral/Memorial : Releases April through October only. the loved one s journey home………. TRINITY RELEASE: Four White Doves released, one by the casket and seconds later three more are set free, joining the lone Dove in flight. This formation represents the FATHER-SON-and HOLY SPIRIT escorting the loved one on their journey home to heaven ………. $ 200.00 April-October only. into heaven………… $ 275.00 April-October only. We are also available for special occasions such as anniversaries, grand openings, golf outings and so on. Please call Gail Yaeger, Senior Fight Attendant, for services, availability and pricing information, or Contact Us. A white dove release may be scheduled anytime during daylight hours, but no later than two hours before sunset. Our policy ensures that our birds encounter safe flying conditions and have sufficient time to return to their loft before nightfall. The health and safety of our birds is of the utmost importance to us. We ensure the humane and ethical treatment of all our birds. We will not release our birds indoors, at night or in inclement weather. This rarely occurs, but it is possible, in which case if any of these conditions occur on your release day, your fee will be returned to you in full. DEPOSITS: A (non-refundable…unless we cannot release due to weather) 50% deposit is required to book your date for weddings, the balance is due before release . Dove Celebration has been all about doing White Dove Releases in all sorts of ceremonies for many years.